Be Confident. Be Prepared. Be You. Q1: Tony, you’ve had such success across several different aspects of the performing arts- actor, writer, director, producer, and in theatre, TV and film. What would you say is responsible for that drive to have your hands in everything, and is there one thing you enjoy more than the others? POV in this business: about story-telling, about the business of story-telling, about nature and human nature, about yourself because who you are, what it all means to you (your POV) is what separates you from the pack. Having a strong POV is gold and it all starts with the desire to know. In terms of what I enjoy more, it depends on the project. Some projects I feel strongest about directing, others writing. Some projects I’ll just want to be involved as a producer and while I haven’t acted in a while, I remain open to the project that may grab my attention solely as an actor. Q2: You have a great perch from which to witness (and reward) the efforts actors make to create their success. Can you talk about what you see that works? A: I find that the people who I have watched enjoy success have been the kinds of people who knew exactly who they are and had the confidence to communicate that in an audition room. They are confident, driven and serious minded people who (along with their talent) have a one-minded focus about what they want from this business. Which is not to say I don’t know plenty of people who are just plain lucky – that happens, too –but outside of good fortune, the ones who come into my audition room with that level of confidence about themselves, along with preparedness and a command of their craft, are the ones I will give a second look (even if they may not be a perfect fit for the role). Q3: Conversely, what ways do you see that actors sabotage themselves? A: The main place I see actors sabotage themselves is during the audition process. I’ve seen very talented actors allow their nerves or insecurities to enter the room which then allows their defense mechanisms to dictate how much of their talent will be on display instead of relaxing and having the confidence they need to give it their best. Defense mechanisms can close a window into you for us, it can also make you less present in the room, less receptive to adjustments. (a deal breaker for me) Something that can get lost when an actor auditions, is the truth that we (as the producer/director/casting director etc) really WANT you to be right for the role. Truth is, we’ve been in this room for hours – days, even – and every person that walks into that room could be THAT person. It’s easy to let the whole affair devolve into feeling that we (on the other side of the table) are sitting in judgement. We may be grading how right an actor may be for the role but the truth is we’re not judging actors, we’re rooting for them. I think that distinction should embolden and liberate an actor to be the very best in that room. That audition slot is your time: embrace it, own it but never second guess it. In the end, even if you don’t get that part, you’ve just had another chance to work on your craft and that has allowed you to take one step closer towards success. One last thing I would add is to be prepared. If you have a chance to read the script (not just the sides) but the complete script you should do it. You should know as much about what you are auditioning for as those on the other side of the table (the ones who have been living with it long before you showed up.) If you can, catch up to us as much as possible. I’ve seen great actors blow an audition because they didn’t understand the role they were auditioning for and, if they had taken the time to read the script,or done some work on the sides, could have easily booked the part. Be confident. Be prepared. Be you. Q4: All of us struggle with the reality that the performing arts is not really a “meritocracy”, in that all the most deserving artists don’t necessarily have the most success. We all rationalize that reality in our own way, what’s your way? A: For me, acceptance is the only way. I accept that this is the nature of the business and rather than focus on what I may find frustrating or arbitrary about it, I choose to focus on why I’m here in the first place. The act of story-telling fulfills me as a person and an artist. This is not to say I am immune to disappointments or frustrations in the business but hitting certain benchmarks in my career are not the reason why I chose this path. I enjoy "the doing” therefore the outcome does not determine my happiness. To put it another way, if my career was at the height of its success today but I wasn’t fulfilled by it, I’d leave the business tomorrow. If the artist’s life truly makes you happy then that is what will carry you through the trials and challenges that will inevitably present themselves along the way. Q5: The time in which we live, with so many platforms for performing and creative artists, can be overwhelming as well as ripe with opportunity. What is your approach to focusing on particular projects among the many that you have going on at any one time? A: Organization and prioritization. You can't do everything — but I always feel compelled to be involved in as much as I can. I don’t think I have a great answer other than that. I determine what’s most important on my calendar and I then I knuckle down and shut everything else out. I don’t deliberate or vacillate. Once I make a decision, I just make it happen. Thanks Tony! 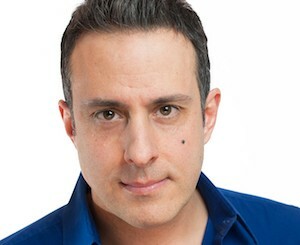 You can have Tony watch your video and give you his honest feedback during March on Actors Insite.